Pokemon GO has been taking phones over by storm! 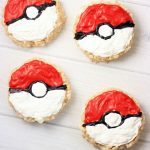 If you are a Pokemon enthusiast, you have to try these Pokemon Rice Krispie Treats! 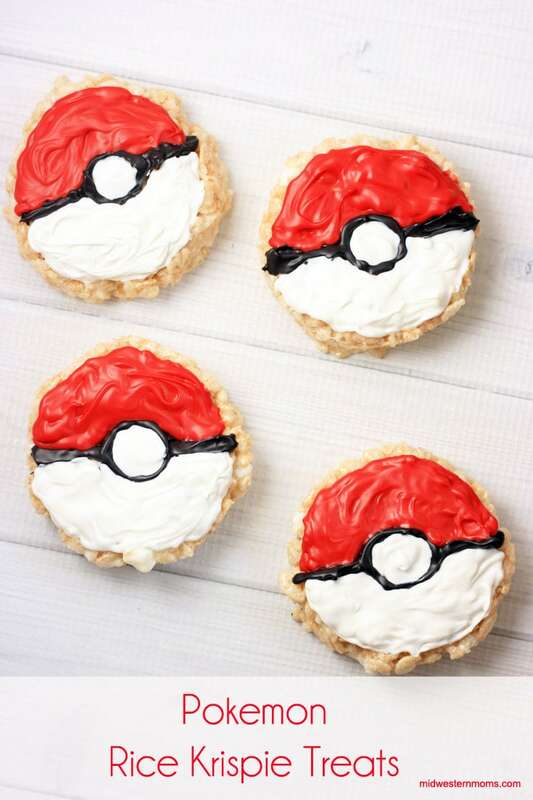 These rice krispie treats would be perfect for a Pokemon themed birthday party!! Any player playing Pokemon GO knows just how vital Poke Balls are if you plan on catching any of those little critters. You just can not play without these little red and white balls. That is what makes these treats are perfect for the Pokemon enthusiast. They are simple to make and delicious! I used my Best Rice Krispie Treat Recipe with Red, White, and Black Candy Melts. I also used a Poke Ball cookie cutter for guidance. It was not thick enough to cut the treats, but I used it as a guide to cut around. I also used the cookie cutter for a guide on the black lines. The circle part was too tight of an area, so I hand drew the circles. I also used the cookie cutter to make these awesome Pokemon Sugar Cookies! I honestly wished I knew how to get a smooth surface using candy melts. I tried my best, but it still has waves. Easy rice krispie treats made into Pokemon Pokeballs! 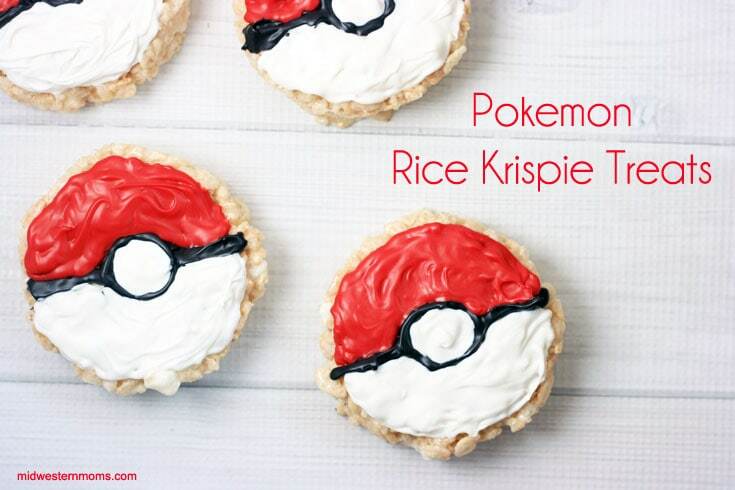 Simple Pokemon Rice Krispie Treats perfect for the Pokemon enthusiast. Slowly melt the butter in a large pan, low heat. Once butter is melted, add vanilla and 6 cups of marshmallows. Melt the marshmallows slowly. Add the Rice Krispie Cereal. Stir until the cereal is fully coated with the marshmallow fluff. Dump into an 9 x 13 greased dish. Use a greased spatula to spread out the treats and press down just a bit (you don’t want them to so compacted that they become rock hard). 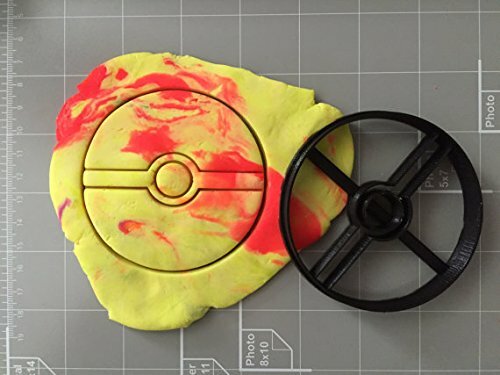 Using the Poke ball cookie cutter, use it as a guide to cut the circles out. Melt the black candy melts according to your instructions and place it in a piping bag. Using the cookie cutter (like explained in the post) draw the lines on the treats. Add the circle in the middle connecting the lines. Melt the red candy melts and place in a piping bag. Fill the in the half circle area above the black lines. Melt the white candy melts and place in a piping bag. Fill in the middle circle and the half circle under the black lines. Allow the candy melts to harden before serving. The BEST Rice Krispie Treat Recipe EVER! Such a cute idea and yummy too.